Out of the mouths of babes | Gary Rubinstein's Blog Has Moved! In the last few weeks I’ve noticed a rise in the ‘student voice’ around education and ed reform. First I had read about StudentsFirst and a student chapter at Cornell, the alma mater of both Michelle Rhee and Randi Weingarten. Then I heard about SFER, Students For Education Reform, which intentionally sounds a lot like DFER, Democrats For Education Reform. I started getting worried that students were being manipulated into supporting policies that will ultimately hurt other students. Then, a few weeks ago two superstars shot onto the scene, Rutgers Sophomore Stephanie Rivera and a Maryland Freshman Zak Malamed. They are members of something called Student Voice, which is, from my perspective, the ‘anti-reform’ counter to those other organizations. They probably wouldn’t want to be labeled as ‘anti-reformers’, as I don’t like what it implies to some people when I am, but I’ve come to think of it as a badge of honor. To be against something that is making things worse than even the ‘status quo’ is the first step in working toward improving the system. Stephanie Rivera recently wrote a blog post called ‘A Student, Future Teacher, and Educational Equity Activist’s Critique on Teach For America.’ This is a very thorough summary of many of the problems with TFA, and it includes a lot of links to support her arguments. The reason that this is such an important post, though, is that nobody can possibly accuse her of being a union shill. She, up until very recently, thought she was destined to be a TFAer, actually, but through learning about some of this issues, especially now that the issues are out there in the media on blogs and even in the mainstream media, somewhat, she seems to agree that ed ‘reform’ as defined by the TFamous alumni causes more harm than good. One of the braver things she does is acknowledge in her last point that poverty is more than just an ‘excuse.’ This takes guts since ‘reformers’ seem to think that it means that anyone who says this doesn’t believe that teachers should even try to help kids who are poor. But there is nobody who thinks we shouldn’t do the best we can. And there is nobody who thinks that the ‘status quo’ is good enough. But looking for the ’cause’ of the achievement gap is really the only way to ever get a plan to shrink it. When reformers start with the premise that the gap was caused by bad teachers and will be shut by great teachers, it sets into motion a series of costly and wasteful reforms that have no chance of fixing things and, more likely, will make things worse. Ryan Heisinger is a college senior who has been his TFA campus coordinator. He also just submitted his application to TFA. He wrote a response to Stephanie Rivera’s critique which I am going to respond to here. Now before some TFA staffers start to go off on me for ‘attacking’ a college kid, let me say that responding to this post is, and I’m sure Ryan will see it this way too, a compliment. What he wrote was very thoughtful and compelling. And just like Rivera can’t be accused of being a union status-quo apologist, Heisinger can’t be accused of being a hedge-fund corporate reformer millionaire. His post does not suffer from the massive defensiveness of anything coming officially from TFA. He truly believes that TFA does more good than harm and presents a collection of arguments much in the way Rivera does. His post reminds me a bit of a well-written Huffington Post piece by Whitney Tilson. Tilson is one of the purest ‘reformers’ out there. I’ve been debating him, via email, for over a year. (Some of the debate has been published on this blog and on his famous ‘mailing list.’) Though Tilson is ‘hated’ by many people on ‘my side,’ I actually like him. I respect his intelligence and his belief that what he does will help kids, though I am positive that he has almost no idea what he is talking about. But I don’t ‘hate’ him any more than the players on the Yankees ‘hate’ the players on the Red Sox. Heisinger includes many interesting statistics and graphs, many from papers by Kane related to value-added. My concern is that any theories that rest on the foundation of the strength of value-added are destined to crumble. I’ve demonstrated in one of my posts that there are teachers who have taught two grades in the same year and who have been rated highly effective in one grade and highly ineffective in the other grade. Value-added is maybe fifty years away from being anything that we can draw any meaningful conclusions from. 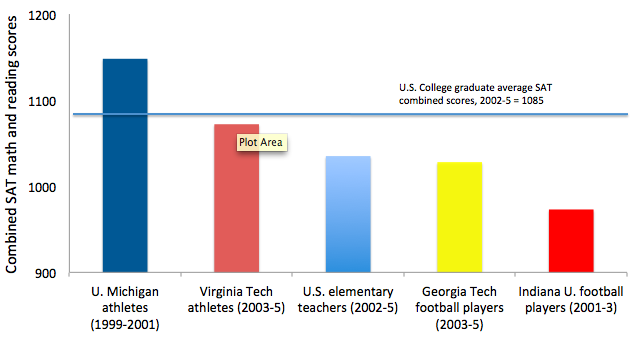 Here’s a graph that shows that teachers are as stupid as athletes. But notice that the graphs begin at 900, which deceptively makes things that are very close seem further apart. A 100 point difference on the SAT really isn’t significant. Now Heisinger did not create these graphs. They were made by people who knew that they were being deceptive when they made them. But Heisinger, like many policy makers, was definitely seduced by them. Heisinger also quotes something from the TFA publicity packet that 7,000 alumni are still teachers. This number is quite misleading. Keep in mind that of those 7,000 teachers, more than half of them are people who are either in their third (and final) year of teaching or their fourth (and final) year of teaching. A more meaningful statistic, and one that we will likely never get from TFA, is what percent of alumni from 1990-2006 are still teaching. I’d say that about 10 percent of TFA alumni became career teachers. This more accurate number is still pretty impressive, but it is way less than the 1/3 that they claim. Basically, the problem with TFA is that they have a tendency to stretch the truth. I don’t want to call them ‘liars,’ but if TFA were a person, its pants would definitely be on fire. They ‘exaggerate’ about the effectiveness of their teachers. This downplays how difficult teaching actually is. The typical first year is full of frustration trying to get the kids to listen for most first years. Here is a recent post by a new TFAer that is typical, I think, of first years. There are just too many things that have to go right. TFA also ‘withholds the truth’ about charter schools. Many are run and staffed by TFAers so they kind of have to tout them, but the absolute truth is that charter schools, particularly the ‘high achieving’ ones do not have the ‘same kids’ as the struggling neighborhood schools. A major study came out a few days ago analyzing charters in Texas including KIPP and YES. This study took about 2 years to complete and the results are decisive. You can read about them here. The worst thing about the charters is that when they skim off the most motivated students from the public schools, and then those schools get shut down and their teachers fired for not keeping up with the miraculous results of the charters. TFA also ‘takes liberties’ when they speak about the TFA alumni who have become leaders of districts, states, or advocacy non-profits. Since TFA claims now to be a leadership organization, this small group of ‘leaders’ has been the net result of 21 years of TFA. The idea is that out of 6,000 2012 CMs, maybe we get 100 career teachers, 50 career education administrators, and 10 big shot leaders. I would be OK with this if any of the leaders that have emerged from this meat grinder so far have had the humility to admit that they don’t really know how to get ‘transformational’ change on a major scale. So far all the big leaders have blind faith in the power of value-added. They are sure that it is good enough to determine which teachers should be fired and which should get bonuses. They are sure that it is good enough to declare a school ‘failing’ and put it on the chopping block. One criticism of TFA that Heisinger addresses is that they are slow to change. He wrote ” But in my experiences in recruitment, visiting and observing at Institute, and speaking to corps members and many of the folks on staff, I have seen an unwavering commitment to constant improvement. TFA collects mountains of data, then looks at all of its practices with a critical eye and adapts them accordingly as it moves forward.” So he has seen the organization improve, even in the couple of years that he has been involved. But I’d say that in my 21 years of experience watching the development of this organization, they have not always gotten better. I think they improved for the first few years. I see that they have gotten worse in the past few years, though. They are getting more defensive and more stubborn, I think. Even their recent attempt to improve by showing everyone how the alumni are diverse in their education philosophies resulted in the ‘Pass The Chalk’ blog which, so far, has not produced even one blog entry that was not the TFA ‘party line’ which they claim does not exist. Heisinger ends his post with a plea “Here’s my final ask: Let’s all continue these conversations in a constructive manner and leave the name-calling and oversimplified political rhetoric at the door. The sooner we elevate the conversation, we’ll elevate the profession and be able to return focus to the people this is all about––the students.” I suppose that some of these ‘conversations’ are not very constructive, but since they have all the money and all the power and they also are ‘creative’ with the facts sometimes, it gets very frustrating to try to have a constructive debate with people like that. I recently had a back-and-forth discussion with TFA (I won’t mention any names here) about whether or not it would be accurate to say that the ‘average’ TFAer has about 3 years of experience. Remember that 11% don’t finish 2 years, 60% stay for a third year, but it goes down quick after that. They would not commit to a number, even an approximation. There is no way that the average TFAer stays for 4 years. That would mean that half stay 2 and the other half stay an average of 6. It must be somewhere around 3 or even 3.5. They just would not acknowledge that this was a good approximation. They said that there’s no way to calculate this since people’s careers aren’t over yet and some people might get back into teaching later. Finally I told them that retention is known to be part of the model and of course it is a problem, but it is, hopefully balanced out by other things that are good. They can’t claim that they don’t have a retention problem. It is built into the design of the program. Still, they wouldn’t acknowledge that the number, if calculated would at least be under 4. This is like saying that motorcycles are dangerous, but you get good gas mileage, and they’re not dangerous. It just doesn’t make sense. TFA, and their recruiters, should take a more honest approach. They should say that the hope is that everyone who does TFA becomes a career teacher, even if they were planning to do something else. They should admit that the first year nobody really closes any achievement gaps. With 1 out of 9 TFAers not completing the two year commitment, well, those 11% probably weren’t making transformational change. The second year is better. Still the second years won’t be that much better than the average teacher. But for people who stick with it, they can become assistant principals and then principals and work their way up the ranks. As far as ‘politics,’ TFA should remain completely neutral. They should admit that their alumni are very divided about what constitutes feasible reform and that some alumni think that the ideas of other alumni actually will harm the children and schools they were supposed to help. TFA should not present skewed statistics to make it look like their most famous alumni are making progress. I know this would be a tough temptation to resist, but it would stop many critics from continuing this onslaught on blogs and other social media. Anyway, I am glad that there are students getting involved. Even though they might be on different ‘sides,’ they seem to be willing to discuss openly, so far. Right now they don’t have anything personally to lose the way some of the big players today do, which helps the discussions continue. I’m looking forward to seeing them (particularly the ones I agree with) continue to write, analyze, and debate. Gary, whether you agree or not, this is not TFA’s mission. They are, I believe, pretty straightforward to everyone that their mission is to provide future leaders with experience in the classroom so they can work, in whatever capacity, to improve the lives of students, hopefully informed by their complex and nuanced experience in the classroom. THAT is their theory of change. What I believe that implies, and this is why I disagree with most of your critiques of TFA being inherently complicit in the curent reform movement, is that enthused, educated, bright, young teachers alone cannot improve education. But maybe if we get enough future policymakers and businesswomen and mayors into the classroom, they will change the system in a more transformational way (increasing funding, demanding better means of evaluation, more early childhood education, higher pay, longer school years, higher marginal tax rates, smarter welfare programs etc.). More career teachers would be great, but everything you write points to the limitations of that approach to improving education, since indeed, poverty is often destiny. If TFA’s theory of change is to produce leaders, which I agree is what their rhetoric has shifted to in recent years, especially now that there are few places with teacher shortages, then why insist that their recruits be the teacher of record? Why not have an assistant teaching program which would not only give “future leaders” first-hand experience in education without denying high-needs children a fully-trained professional educator but would also vastly help current teachers in struggling schools? I participated in the JET Programme in Japan for three years as an assistant English teacher in a Japanese high school. The Japanese would never give their students an unprepared teacher, so we were not expected to have full teaching duties. Rather, we were expected to supplement and improve the instruction of the highly-trained teachers. Why not adopt this approach while allowing those interested in later becoming fully-certified to become trained at night and after a year or two switch into teaching? Those who wished to move on to another field would not be inflicting the harm of yet another unprepared novice on children needing so much more. If TFA made this change, and they seem to have more than enough funds to finance this, critics like me would be much happier with the program. What’s stopping them from changing? So I think that’s a legitimate question. I assume TFA’s response would be that their data is good enough to keep their system going, or at least not bad enough to shut all that down. But I think TFA should have some lower-bound measure of their CMs performance at which point they decide they need to drastically change their mission. Any organization or person that can’t answer the question “what would it take for you to be convinced your wrong” is not being intellectually honest. I’ve posed a similar question, asking why TFA isn’t experimenting with other teacher prep models (like a residency or a MATCH-inspired year of tutoring that then shifts into teacher prep) while keeping their primary focus. I also heard that in New Orleans there is some experimentation (at particular TFA-filled charters) with having first year teachers only co-teach with more experienced teachers rather than have their own classroom. I think this is a good start. Why are they not doing more? Maybe they are afraid it will seem like they are admitting that their 5-week training program can’t succeed (which I, as an ambivalent TFA supporter, am not yet ready to do). Perhaps they are listening to the standard advice for organizations to stick with a model people know and understand and not get too crazy with experimentation that dilutes their core focus. But in general I totally agree that more experimentation in that area would be beneficial and totally feasible given TFA’s resources and ties to schools and ed programs. The other question I think this discussion begs is: why doesn’t TFA spend more time preparing CMs to use their experience in the classroom in productive ways? Given that it is their core mission, why don’t they train us to do that effectively? But I wish these were the questions critics were grappling with. I also think part of the answer to “why doesn’t TFA change?” has to do with the current political climate in education. TFA is politically very popular with those outside education but with power, money, and influence. TFA has no real pressure to change as they are expanding widely despite the flaws in their training program. Also, while it’s hard to say what TFA itself believes about this, TFA offers a very cheap way to staff schools to cash-strapped districts. It’s also loved by organization seeking to weaken teachers unions. And so you see very sneaky and underhanded ways to fire more experienced teachers through budget cuts or school closures/turnarounds. 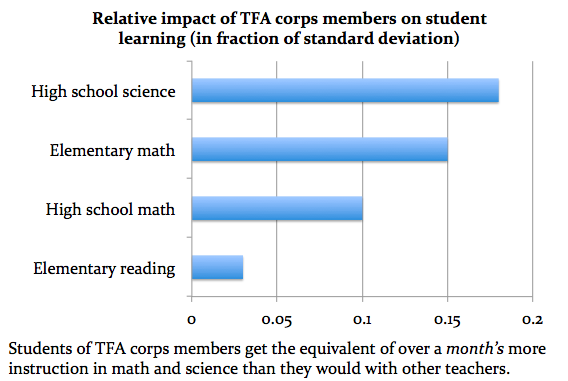 A first year TFA novice is not likely to be a more effective replacement and the resulting churn in staff is demonstrably bad for kids, but they are certainly cheaper. A different training model–perhaps one with residencies or assistant teaching–means districts would not be saving money. The kids would certainly be getting better education (all that useful youth, enthusiasm, and drive would be welcomed as an addition to an experienced teacher’s work), but the incentive for districts to cut their labor costs would be gone. This reality is why I believe it is so important for more people like Gary and other critics to continue to put pressure on TFA and expose the misrepresentation of data as well as the realities of classroom teaching. Getting the message that TFA’s current model is flawed into the main-stream media is critical to forcing change that will help kids. I am glad that the uncritical support of this flawed program is finally being questioned. And I hope the pressure becomes so great that TFA finally is forced to change. My problem with this is that the TFA alumni who have moved into educational advocacy aren’t pushing for smaller class sizes, more ECE, more pay (because they link higher pay to ending teacher pensions, it’s a pay cut), better classroom conditions, or any of that. They’re advocating for an end to tenure, more standardized testing, more punitive measures against teachers and schools, less education funding, larger classroom sizes, more free market ideology, and so on. These changes aren’t only not evidence-based, they show a real lack of understanding about teaching as a career and a remarkable amount of hubris. Whatever they’re learning from their two years in the classroom is leading these “agents of change” to some badly thought-out conclusions. That argument has been made many times before, especially on this website. I doubt its accuracy for both logical and empirical reasons. First, I don’t see any causal mechanism by which teachers can desperately struggle in the classroom for two years and then leave thinking that poverty, school leadership, and unreasonable expectations for teachers are not part of the problem. Second, I think you are using a flawed methodology. You see many advocates of school choice (the usual suspects) and people they hire and support, many happen to be TFA alums, and conclude that TFA alums believe whole heartedly in these reforms. But obviously Michelle Rhee is going to hire TFA alums who agree with her politically, not those that do not. You do not see or hear from the TFA alums who are teaching, who are lawyers representing unions, who are pushing for more equal tax policies, etc. I certainly think it is an interesting question, and would like to see some empirical evidence put forth by TFA (a simple survey would do) to see what TFA alums are actually doing around education. I would put money that they, on the whole, are doing a lot of good. Well, as a TFA alumni I have to say that I have more contact with the organization than you seem to assume. But even if I wasn’t and I didn’t, when TFA chooses its “educational leaders”, it makes choices in whose accomplishments are important and worth heralding. This isn’t just nefarious Reuters making sidebars; these are the people TFA routinely praises itself and internally. Your point would be more defensible if TFA highlighted union lawyers, tax equity reformers, and so on. They don’t. Fair, they could do a better job highlighting those leaders. But attacking TFA’s PR machine is legitimate and easy, but doesn’t always get at the big questions at stake. This is entirely anecdotal; however, the majority of corps members who I personally know, who only spent 2-3 years in the classroom and left to pursue other opportunities in education outside of schools, side with TFA/reformers. This does not necessarily include those who left to pursue other careers/grad school after their two year commitment, because they are no longer in the picture, which is certainly their right. The opportunities in education for non-instructional or school related jobs for teachers with only a couple of years experience are often in the reformer camp. You just don’t see as many alums on the other side of the argument because not enough alums work in schools long enough to have a deep understanding of the issues. I don’t mean to sound too cynical, but the incentives are strong for teachers with 2-3 years of experience, who are no longer in the classroom, to believe and advocate for current reform efforts, since toting this line will lead to opportunities that are less stressful, financially more lucrative, and more prestigious in the eyes of their social network. I also do not believe 2 years in a classroom makes one qualified to make better policy decisions than those who have no classroom experience. If this were the case, the current TFA alumni who have more powerful positions would not be championing policies that actually harm kids more than they help, which contributes to more and more of our best urban/rural teachers to leave the profession entirely or to work for schools in districts where you aren’t smothered with as many harmful initiatives year-after-year. Their interests are once again political and financial and it’s really hard to take them seriously as advocates for children. What I do not understand about this argument (Or TFA’s mission, therefore, is that, if it were your child who was going to demonstrate the difficult nuances of education to a future leader, at the cost of not having a fully committed teacher, would you be enthused, or pull your kid for private school? Personally, I’d do the latter, even though I am a public school teacher. My child is not your young leader’s “experience fodder” and to subject someone else’s children to it for the good of the greater good, is an arrogant, classist act. Good point. I didn’t mean literally that 2nd years are better than half the teachers. When I think about the steep learning curve of learning how to teach, I think that there is such a big difference between 1st years and everyone else. So I think of almost everyone past the first year as ‘above average’ meaning, just, ‘pretty good’ and not in the literal sense. But this is the problem. When TFA is criticized for teachers only teaching 2 years in schools that most need it and moving on and causing instability, then TFA says “Oh no we value teaching and value alums that stay teaching which many do” But then they also tow the “No its all about 2 years and then you need to be a “leader” line. It’s like they are trying to live in both worlds and play both sides when needed. You’re right, it is certainly a tenuous and often paradoxical dual mission. TFA would argue that they are certainly happy and excited to have a decent (relative to other institutions that train first year teachers) percentage of teachers who stay 3+ years or for a career, who they would describe as “leaders” in the classroom and in schools. The chaos/instability argument is also important. I think we all need to try to find ways to evaluate whether the benefits of longer-term TFA teachers and alumni leaders in the education system or in other sectors to our schools outweighs the costs through increased instability (teachers leaving after two years or before and first/second year teachers underperforming). How can we possibly do this? I’m not sure. But this is certainly only one of the many, many facets of our educational system that confound attempts at objective/accurate data gathering. More Students Questioning SFER’s Principles « Teacher Under Construction linked to this post.